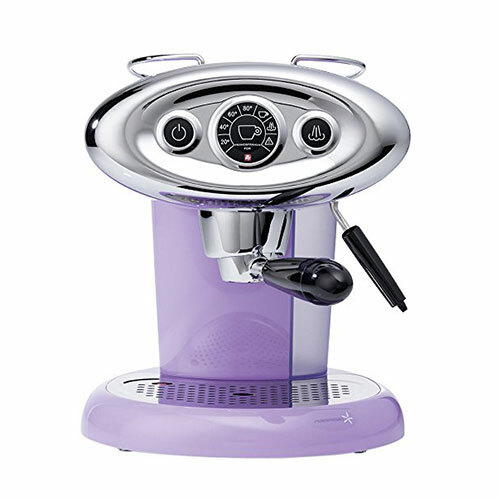 Make café-quality espresso coffee in to your kitchen with the X7.1 Lilac Coffee Machine by Francis Francis, its revolutionary iperEspresso system delivers two stage extraction technology offering the next level in home coffee machines. It’s contemporary design is both iconic & innovative, featuring an illuminated central display and acoustic signals to guide you on your way to your ideal espresso, cappuccino or latte, providing you with luxury drinks every day of the week. The coffee is extracted within the capsule producing a full-bodied and long-lasting crema. The machine is simple to use, inserting an iperEspresso capsule and with one touch of a button, the illy espresso brews into the cup without any contact with the machine, making it easy to maintain & clean, it never comes into contact with the coffee. Perfect quality is guaranteed every time, with the ability to serve 22-30 hot drinks thanks to the large 1 litre removable water tank. The machine features an automatic descaling program and an auto-stop feature to control the cup volume.